Jan requested fresh crackers for her dinner with her friends. While they are good all by themselves—“Crack”ers, as Jan calls them—I thought I would add a spread for them while my diners waited for me to finish the other dishes. A tapenade is a primarily made from chopped olives, with a bit of oil to make it a paste. What else you add depends only on your tastes and imagination. I had a half a roasted red pepper that I had made for a dish that I did not complete. 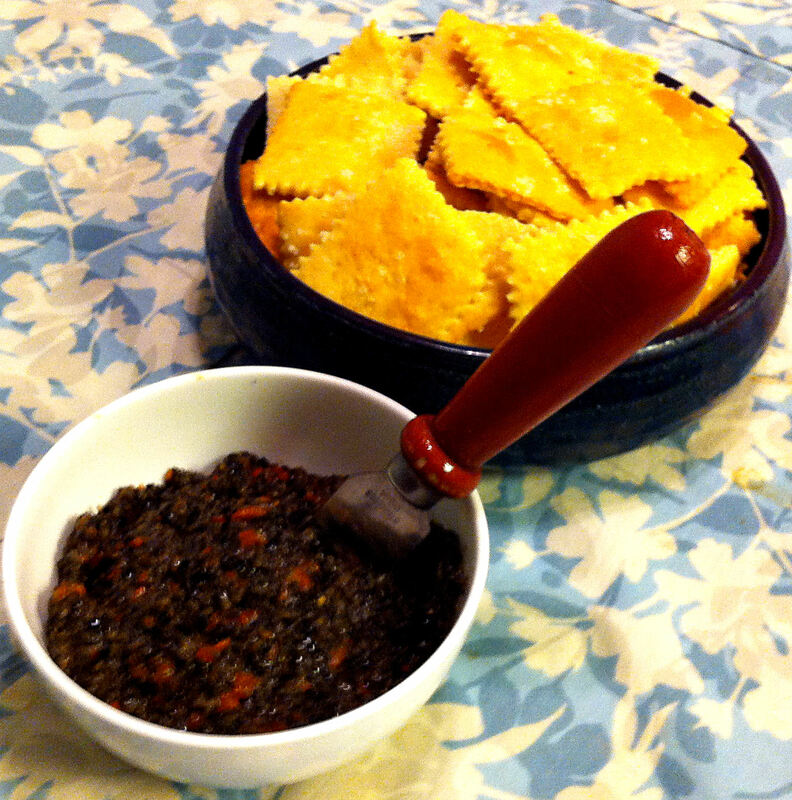 I did not want it to go to waste, so I built the tapenade around it. This was a simpler version to one I made before. 1. Broil the red pepper until well blistered. 2. Put the pepper in a plastic bag and let it cool for ten minutes. 3. Remove the seeds, veins and skin. 4. Mince the red pepper finely. 5. Put the pepper, olives, anchovy paste, garlic, pepper and salt into a small bowl and mix it together. 6. Add only enough oil to get the ingredients to hang together. 7. Use an immersion blender to turn some of the mix into a fine paste. Tip: A tapenade should not be a smooth paste. You want it to be a little bit chunky, but the bits should be fairly small.